(Phys.org)—A team of researchers affiliated with Eötvös Loránd University of Sciences in Hungary has found that wolves hand-reared by adoptive humans grow to show signs of attachment and affection towards their human foster parents. In their paper published in the journal Royal Society Open Science, the researchers describe how they asked a group of volunteers to hand raise wolf puppies and then tested them to see how attached they became. It has been long believed by animal scientists that wolves cannot be socialized with humans—they are simply too wild. Still, the relationship continues to be studied as researchers seek to better understand the circumstances that led to the domestication of dogs—which, it might be noted, are not descendants of wolves. In this new effort, the goal was to find out if wolves raised like family pets would become attached to humans, and if so, in what ways. The study consisted of asking volunteers with the Family Dog Project to raise wolf puppies and to treat them just as they would dog puppies. 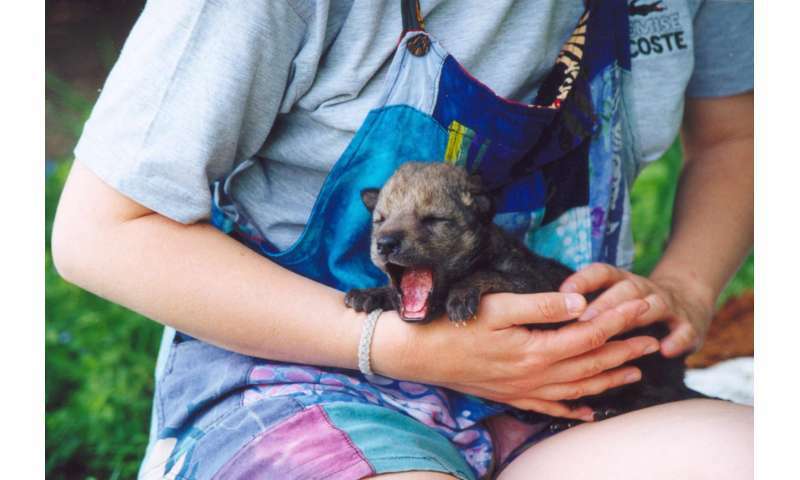 In such an environment, the wolf puppies would be intensely socialized with their human families. As the wolf pups reached certain age milestones, the researchers visited the wolves and their foster families and conducted socialization tests to measure how attached the pups were to the humans with which they lived. In this study, they measured greetings displayed by the wolves to four different types of human visitors—those that raised them, those that were around a lot, people they had met just once and people they had never met—at three age points, 6, 12, and 24 months. In the first of the experiments, the pups were exposed to the humans while among other wolves, giving them a security blanket of sorts. In the second, the pups were forced to go it alone. The researchers report that that in all cases, the six-month-old pups greeted all humans they encountered warmly and affectionately. The 12- and 24-month-olds also cheerily greeted humans they knew well, but were slightly more reserved with humans they didn't know or barely knew. They also noted that some of the wolf pups showed crouching and tail-tucking when confronted with strangers, a sign of fear in wolves. The researchers note that because some of the wolves were two years old, it seemed reasonable to conclude that the attachment they felt and the affection they showed to those humans they knew well likely would reach on into adulthood. Socialized wolves' relationship with humans is a much debated, but important question in light of dog domestication. Earlier findings reported no attachment to the caretaker at four months of age in a Strange Situation Test, while recently attachment to the caretaker was reported at a few weeks of age in a similar paradigm. To explore wolf–human relationship, we analysed behaviours of hand reared, extensively socialized wolves towards four visitor types: foster-parents, close acquaintances, persons met once before, and complete strangers during a greeting episode. As hypothesized, in the greeting context subjects showed more intense and friendly behaviour towards foster-parents, than other visitor types, which may reflect familiarity and affinity. However, differences were more pronounced in the group situation (at six months of age) than in the individual situation (at 12 and 24 months), suggesting that unique status of foster parents may become less distinct as wolves get older, while exploration of novel social agents is expressed more with older age. Fear related behaviour patterns were only found in the individual situation, mainly displayed towards strangers. We showed that, in case of extensively socialized wolves, distinctive affiliation and affinity towards the foster parent prevails into adulthood. "...the domestication of dogs—which, it might be noted, are not descendants of wolves"
"Over the past million years, numerous wolf-like forms existed but their turnover has been high, and modern wolves are not the lineal ancestors of dogs. Although research had suggested that dogs and wolves were genetically very close relatives, later phylogenetic analysis strongly supported the hypothesis that the dog forms a monophyletic clade that is sister to Eurasian wolves, and these together form a sister clade to North American wolves. This indicates that an extant wolf population that is the ancestor to dogs has not been found and is presumed extinct. The dog is not a separate species to the wolf." It looks like dogs are not the descendants of modern wolves, but still descendants of an extinct wolf. Sounds a lot like splitting a hair. I am a geek and like splitting hairs but when it comes to behaviors in the case, I am not sure that one split hair is different from another, if you get my meaning. @rustolo, I was going to write the same thing. It's a confusing sentence. Dogs are descendants of wolves, but not of modern ones. Meh, if they didn't have the capacity we'd never have domesticated them in the first place. Many animals have the capacity to bond to humans, since we emulate parental behavior by their conspecifics. The prevalence of braindead claims that animals cannot learn continues to amaze me by its constant repetition by so-called "behaviorists" who bray that because animals are not as smart as humans they're "essentially different." My cat is smarter than they are. To put the matter simply, Skinner was a crank. Sorry, but the data don't support the conclusions his supporters draw. My cat says he's wrong; the cat is attentive *after* being fed. If it were only stimulus/response the cat would be attentive before being fed and ignore me when he's not hungry. This nonsense is teh stupid. Let's stop pretending that animals don't have feelings like we do and admit that they have our capacities but in lesser degree than we do. So, according to these morons, when the N. American Wolf goes extinct, dogs won't be descended from anything. These are the same idiots who think Neanderthals are extinct. So, according to these morons. These are the same idiots who think Neanderthals are extinct. Why is it trolls always use the word moron, stupid, dumb etc for anybody that has a different way of looking at somthing than they do? Is it a way to try to make themselves feel smart? Or are they just really opinionated?